Many marketers claim that personalized green & white 62” arc vented golf course umbrellas possess “Midas touch” because they have brought them easy visibility. 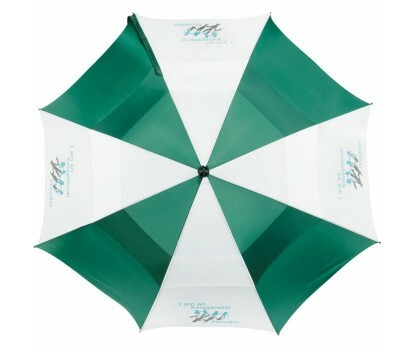 Generally promotional green & white 62” arc vented golf course umbrellas are sought for presentations during golf matches and other sports events. Marketers who have high expectations from their investments can seek custom green & white 62” arc vented golf course umbrellas for corporate gifting during promotional events or hand it out after service as an acknowledgement. People will be definitely happy to grab a large size and beautiful green and white umbrella extended to them and they will retain it for long time, too. Features – Manual opening function. A large green & white striped nylon vented canopy with matching color case and shoulder strap. Fiberglass lightening resistant frame. Imprint area - 6" H x 8" W.
Product Size : 9" x 8" x 39"
Customer Service & Shipping - We were in a time crunch for shipping but they made it happen and the umbrellas were delivered right on time.